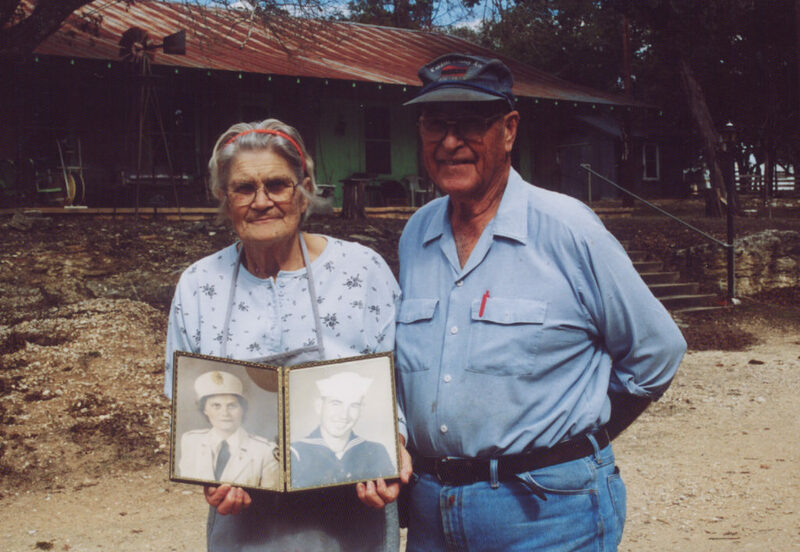 Clifton and Adela Frantzen stand in front of their home holding a picture from their army and navy days. It was a cool February morning. 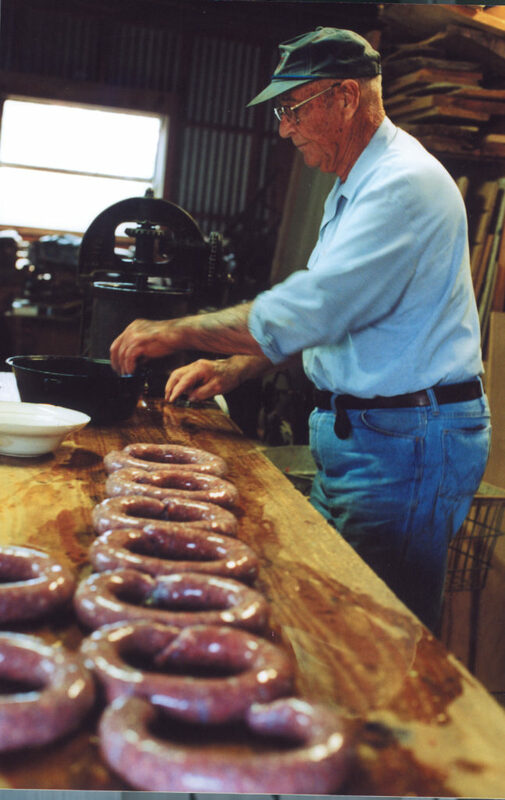 The call came from Clifton that the sausage was already being ground up and that they were working at a pretty good clip, so I had better get on over there to the Frantzen farm to see it being made. Clifton had promised me earlier in the year that the next time he made sausage I could be there to watch. I grabbed my notebook and camera and headed over to the Frantzen farm just north of Boerne, Texas. 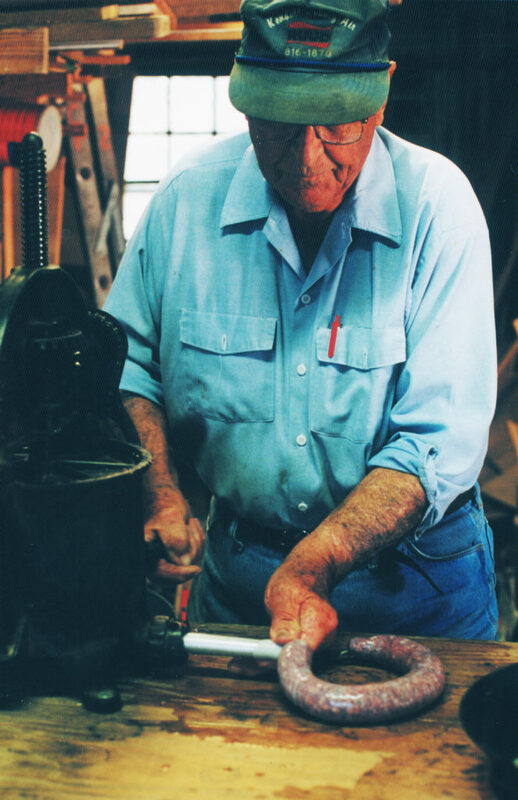 Clifton’s woodshop was set up for making the sausage with a big wooden table placed right in front. The sausage stuffer was attached to the table on one end. A metal contraption with a vessel in the center for the meat, the stuffer had a round cover that swiveled and a hand crank on the right side with what looked like a bicycle chain to drive it. On the front was a round metal tube used to attach the casings. There were two big metal tubs of ground meat. Clifton took one and began to kneed it like dough. “You have to get the air out of it,” he said. Then he picked up a scoop of the meat and began to fill the sausage stuffer. 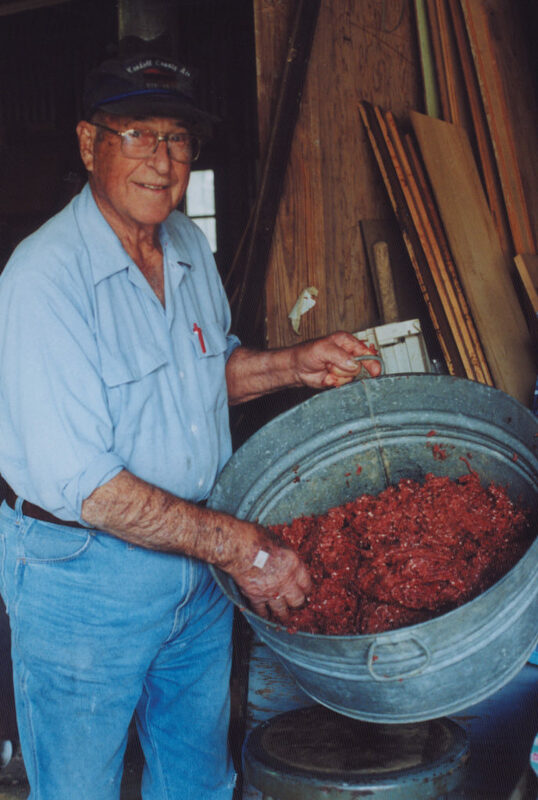 He punched the meat down into the machine to remove the air and repeated to put in more meat in it until it was full. Like an athlete that doesn’t have to even practice his technique, Clifton grabbed the casings out of the warm water and quickly wrapped them around his arm – elbow to thumb. After the casings were in several loops, Clifton held them for Adela to cut. They were each cut at about 20 inches long. Clifton put water on the wooden table so the sausages could slide. Taking one casing, he attached it to the metal tube on the sausage stuffer. A clip was used on the end of the casing to prevent the sausage from popping out. As Clifton cranked the wheel, sausage filled the casing. The finished sausages were slid across the table and were all lined up in a row. 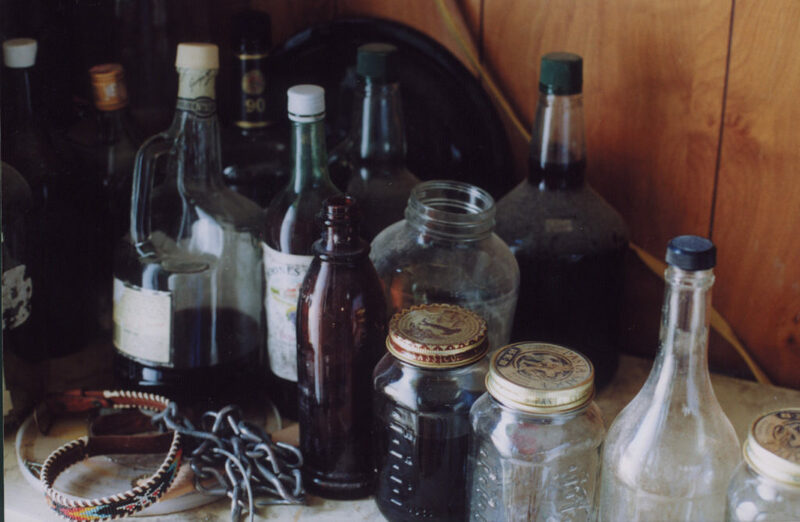 Adela remarked how it was her job to stir the blood when she was a kid. “Oh, I hated that,” she said. When all of the sausages were ready. Clifton began to tie the ends. “I learned this knot in the navy’” said Clifton. 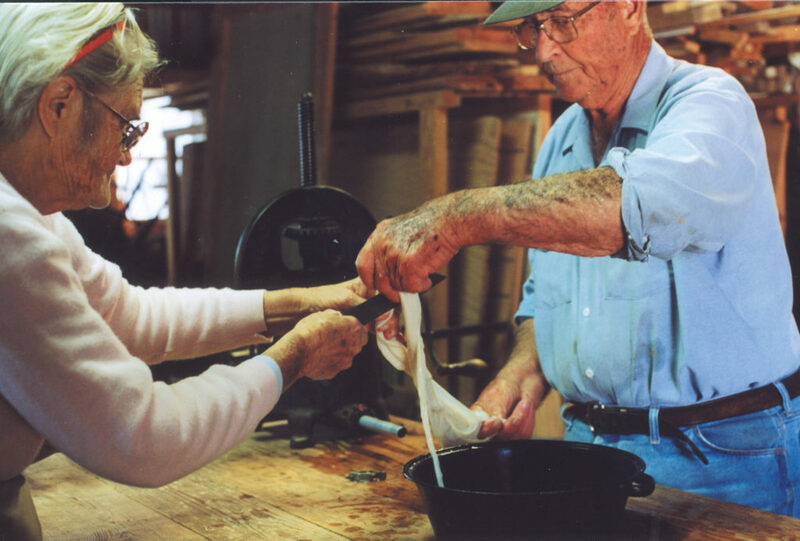 We also used this knot on the farm where we call it a hog knot, but it has a different name in the navy.” The knot consisted of two loops that crossed in the middle and when pulled tight would really hold without loosening. 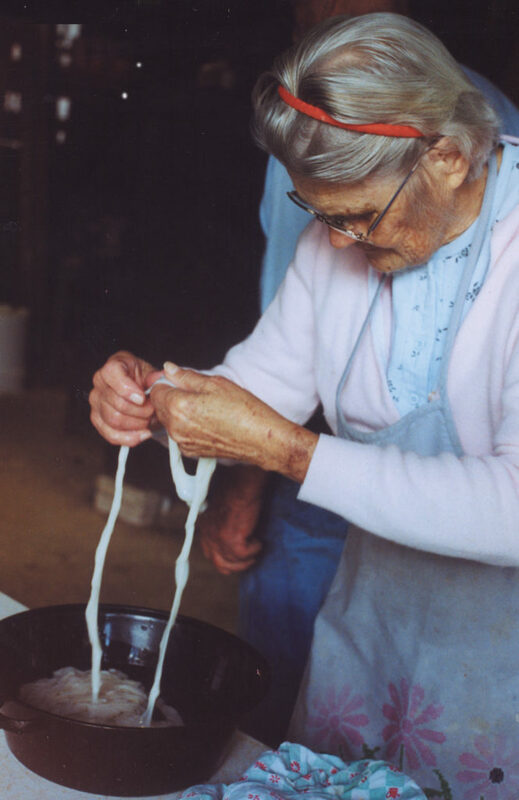 After the sausages were tied, Adela made a few cuts of the twine. 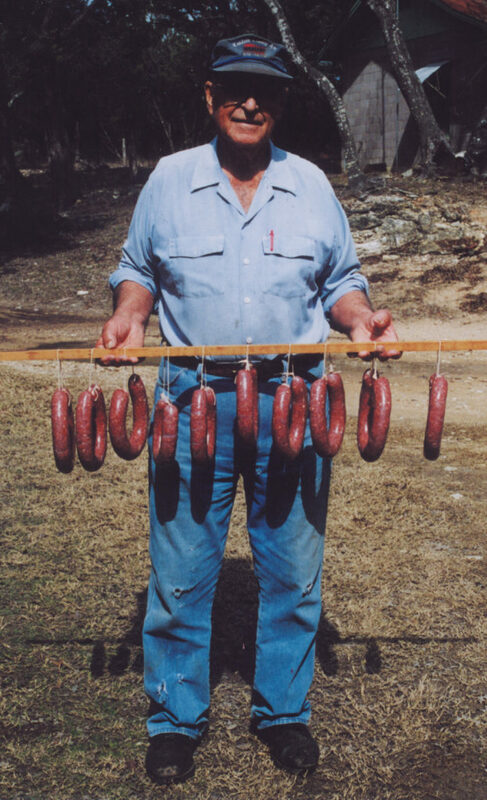 The sausages were then hung on a wooden pole to air dry for a day before bringing them into the smokehouse. This drying period allows the sausage to be peeled much easier. 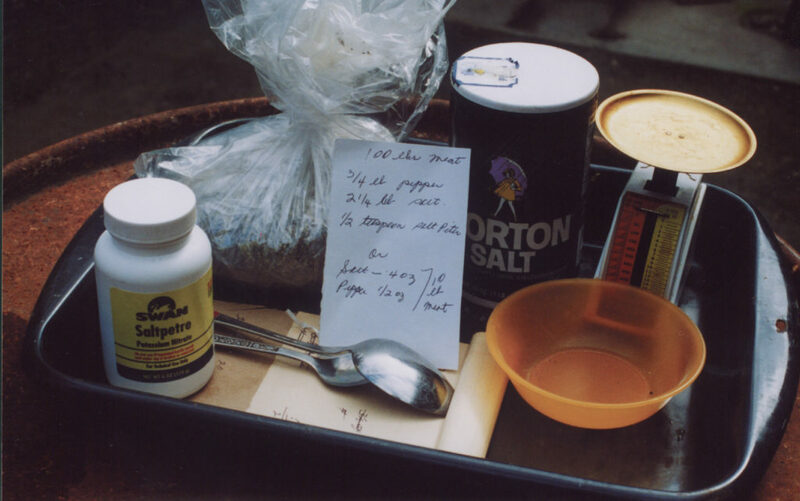 The smokehouse at the Frantzen’s has a sand floor to prevent sweating. Vents are at the top of the building and a big fan is used to prevent moisture build-up. Wooden bars hang from the ceiling that holds the racks of sausage to be smoked. I’ll sure miss Clifton & Adella Frantzen, but I am glad I was able to enjoy a day watching them do what they loved to do. That is a memory I will not forget.